I am so not a cat person. Okay, that’s not fair. Some cats I like. The cute, cuddly ones. The huge, snarling, striped ones? Not so much. I was starkly reminded of that fact as I faced down three enormous, snarling tigers. That’s right, tigers. As in, six-hundred-pound killing machines. I shot a look over my shoulder. The iron-barred door leading out of the tigers’ enclosure was slightly ajar. That was my escape route. I just hoped the tigers didn’t notice it. The last thing my brother Frank and I needed was to be responsible for three loose tigers terrorizing the Bayport Zoo. One of the tigers let out a low growl. That snapped my full attention back to them. “Good kitty kitties,” I said in what I hoped was a soothing voice. “Quit kidding around, Joe,” Frank hissed from beside me. He didn’t take his eyes off the largest of the three big cats. It was eyeing a chunk of raw meat lying between itself and us. The meat was thick and juicy, oozing with blood. Frank’s a sucker for innocent schoolkids. So am I, actually. That’s one of the reasons the two of us joined ATAC. You know—righting wrongs, fighting injustices, keeping illegal drugs out of the hands of schoolkids—that sort of thing. What’s ATAC? I’ll get to that in a minute. First, back to the tigers. Frank looked doubtful. But he did as I said. Sidling back to the exit, he jumped out. That left me alone with the tigers. Did you ever see a tiger up close and personal? If not, let me tell you: They’re huge. Really huge. I glanced at Frank. Then back at the largest tiger. He looked hungry. Two of the tigers turned to look at him. But the big one kept right on staring at me. Only a twitch of its huge fuzzy ear showed that it had even heard Frank. Then it licked its chops. Nice. If life was a Bugs Bunny cartoon, I would’ve transformed into an eight-course meal. The tiger narrowed its eyes. Maybe it didn’t want to be slim. The rest of his comment was drowned out by the sound of the cage door slamming shut. “Hey!” I blurted out, jumping and spinning around. A skinny little guy with greasy hair grinned evilly from the other side of the door. “Time for lunch, boys,” he sneered before turning and racing away. “Go after him!” I yelled to Frank. He was already grabbing at the door to the cage. But it was no use. When Frank shook it, it didn’t budge. The lock had latched automatically when that smuggler slammed it shut. Frank hesitated only for a second. Then he raced after Greasy Hair. I guess the bad guy hadn’t gotten very far, because a moment later I heard an “Oof!” and then a bunch of cursing. But I wasn’t focused on that. The big tiger had just taken a step closer. “Easy, big guy,” I said. I have a pretty cool head in most situations. I can handle just about anything a bad guy can throw at me. But tigers? This was a whole new deal. And I didn’t like it. “Rajah! No!” a female voice cried from somewhere at the back of the enclosure. That finally got the tiger’s attention off me. It pricked its ears, and its head swiveled toward the voice. The other two tigers looked that way too. I followed their gaze. A girl was standing in an open doorway at the back of the enclosure. Even in my current state of near panic, I couldn’t help but notice how pretty she was. The tigers must have liked the looks of her too. Or maybe they just thought she was bringing more food. They all turned away from me and walked toward her. I darted forward and grabbed that chunk of meat. It was cool and moist and heavier than I expected. It slimed through my hands and almost slid out of my grip, so I hugged it to my chest. Gross. Now I was moist and slimy. But I didn’t stop to worry about that. I ran for that back door, pushing past Zookeeper Babe. Okay, that was a little annoying. I mean, sure, I was grateful that she’d just pretty much saved my life and all. But why did cute girls always go for Mr. Tall Dork and Handsome? “I hope Mom and Aunt Trudy don’t notice that you’re coming home wearing a different shirt than you left with,” Frank fretted as we parked our motorcycles in the driveway. I glanced down at myself. I’d tossed the shirt that got slimed by that raw meat back at the zoo. This new one was from the gift shop. I’d had to turn it inside out to hide the embroidered panda cub on the pocket. He still looked anxious. That was typical. Frank’s always looking for the worst-case scenario. Me? I prefer not to worry until I have to. That brings us back to ATAC. The name stands for American Teens Against Crime. 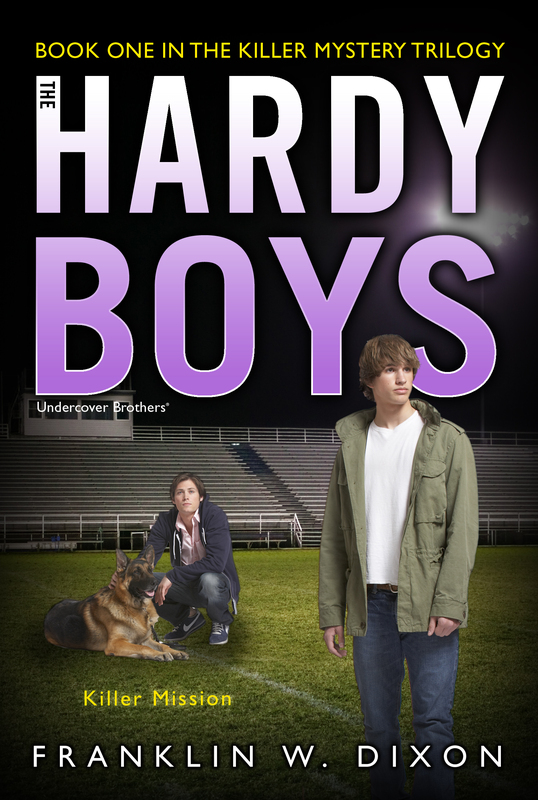 It’s an undercover crime-fighting group started by our dad, Fenton Hardy, and staffed by teen agents. Why teens? Simple. We can go certain places and do certain things that adult agents can’t pull off. For instance, we were able to pose as high school interns at the zoo and figure out how the drug runners were slipping their merchandise past the cops. Other assignments might send us somewhere like a rock concert or a skateboard park. Basically, anywhere teens would hang out and adults would stand out. It’s pretty much the coolest job in the world. Nobody was around when we let ourselves into the house. That gave me a chance to sneak upstairs and change my shirt. Better safe than sorry. Good thing. Because as soon as we flopped on the couch in the den to start relaxing, Aunt Trudy found us. And she had that look in her eye. Aunt Trudy is Dad’s sister who lives with us. She never got married or had kids, so I guess Frank and I became her substitute kids. She loves to boss us around. “Where have you two been all day?” she snapped, looking us up and down. Whew! No way that panda shirt would’ve passed without notice. Not even turned inside out. Frank and I traded a look. We weren’t about to tell her we’d been tussling with tigers at the zoo. But she hates when we just say “around” or something like that. Luckily, our ATAC training has taught us how to think on our feet. I winced and glanced at the big wire cage in one corner of the den. “That clever bird” was our parrot, Playback. We sort of inherited him during one of our earlier ATAC cases. Now he was part of the family. He had two cages—that regular-sized one in the den and a huge one in the backyard, where he got to hang out when the weather was nice. “Wimps!” he squawked at us. For some reason, that’s one of his favorite words. She crossed her arms over her chest. Uh-oh. That usually meant trouble. Gee, thanks, Dad, I thought with a flash of annoyance. I mean, okay, you couldn’t blame Aunt Trudy or Mom for riding us about missing chores or whatever. They’re both clueless about ATAC. They really think Frank and I spend most of our time going off on school field trips, study programs, and whatever other crazy cover stories we come up with to explain our travels. But Dad? He knew exactly where we’d been that day. And he should have known that the last thing we’d feel like doing was cleaning bird poop out of Playback’s cages. So why couldn’t he cut us some slack? “We’ll get right on it, Aunt Trudy,” said Frank. That’s Frank for you. Mr. Fair. Unfortunately for me, he was also Mr. Lucky—that day, at least. He won the toss and picked the inside cage. “Cool. It’s you and me, big guy,” he told Playback. That left me with Playback’s backyard palace. Great. It was way larger than the inside one and got cleaned less frequently. That meant I was in for a huge, stinking, fly-encrusted mess. “Have fun,” Frank said with a smirk. Nice. I shot him a glare, then grabbed a bucket and scrub brush from the laundry room and headed outside. Might as well get it over with . . . The cage door was standing open. Flies buzzed in and out. It was almost winter—you’d think they’d all be frozen or hibernating or whatever flies did when it got cold. But no. They were here, making my miserable job even more miserable. The cage was taller than I was. I didn’t even have to duck as I stepped inside and looked around. It was pretty foul in there. I wished that cute zookeeper was around to help. And not only because she came with a shovel, a hose, and lots of experience cleaning up after messy animals. Just seeing her might distract me from the grossness. Oh, well. Maybe thinking about her would help. I tried it as I got started. Dipping my brush in the water, I stepped over to start scrubbing the main perch. As I did, something whacked me on the head. “Hey,” I muttered, looking up to see what I’d bumped into. A large new mirror bird-toy thing was hanging off the bars of the cage. Where had that come from? I wondered if Aunt Trudy, who had developed a soft spot for Playback, had started buying him stuff. Then my eyes widened as I realized there were actually two mirrors attached together. And something was stuck into the narrow space in between. I dug in with one finger—and pulled out a shiny silver disk. “Whoa!” I whispered, shooting a quick look around the backyard. Even as I did it, I knew it was pointless. Whoever had hung that mirror toy was long gone. I grinned. Then I dropped my scrub brush, tucked the disk into my pocket, and took off for the house.